This tiger - enjoying his life at the Philadelphia Zoo - is maintaining his regal presence, befitting his status as a Big Cat, although he is just one of over 1,300 animals, at the Zoo. To fully appreciate the tiger's majesty, just click directly on the photo to enlarge it. 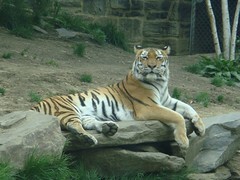 The Philadelphia Zoo attracts more than 1.2 million patrons a year, to enjoy its vast assembly of over 1,300 animals. The Zoo provides superb education and entertainment for visitors of all ages, and is the most popular family attraction in Philadelphia. The Zoo is open 360 days a year, and one extra in leap year. The only days on which it is closed are Thanksgiving Day, Christmas Eve (December 24), Christmas Day (December 25), New Year's Eve (December 31), and New Year's Day (January 1). When open, its hours are 9:00 AM - 5:30 PM, every day - in season - which it defines as March 1 - October 31. We're not sure what the precise hours are out of season, since this is being written in July 2010. There are many options for getting to the Philadelphia Zoo. Due to its relatively remote location in Fairmount Park, it is one of the rare places to visit in Philadelphia, where you might be better off driving, than taking public transportation. We emphasize that the Philadelphia Zoo is located two miles from Center City, and it is not within walking distance from the other major Philadelphia attractions. So there's a time investment to get there, as well. But here's how to do it, via mass transit. If you are visiting the Zoo between May 1 and Halloween, the purple Phlash Trolley is - far and away - your best option. It is inexpensive ($2 each way, $5 for an all-day pass), it doesn't require tokens, and best of all - it takes you right to the front gates of the Zoo. The downside: Regrettably, the Phlash does not run - at all - during the other six months of the year, and it also stops running around 5 - 6 PM. In other words, make sure that you ask your Phlash driver, before you get on, whether this particular Phlash is going all the way to the Zoo, and if it's the last trip of the day. Moreover, make sure you ask when the last Phlash leaving the Zoo is scheduled to take place, as otherwise you'll have to take the 38 bus or a cab. SEPTA - although more cumbersome - at least has the advantage of running year-round, and at night. We would strongly recommend taking the Route 38 bus, which runs from Independence Mall, snakes through Center City Philadelphia, and continues to the Zoo. You can make many easy connections with the 38, throughout Center City. However, service is sporadic - during off-peak daytime hours, it only runs about every 20 minutes or so. And it will take at least 20 minutes for the 38 - even leaving at 15th and John F. Kennedy Boulevard - to make it all the way to the Zoo, given all of the stops. So if you are boarding the 38 east of 15th and JFK, expect the trip to take even longer. If you are taking the Blue Line / Market-Frankford Line / the "el" - which are just different names for the same line - get off at 15th Street Station, which puts you at 15th and Market Streets. You can then walk up one block to 15th and John F. Kennedy Boulevard, and pick up the westbound 38 (make sure it's a westbound bus). You can do the same thing with the Broad Street Subway / SEPTA Orange Line - just take it to its City Hall Station, which drops you off at Broad and Market Streets. Just walk over to 15th and JFK for the 38 bus. If you are coming from out of town, via Amtrak - after you get off your train at 30th Street Station - if you're pressed for time, we would recommend that you jump into one of the plentiful cabs there and head to the Zoo. You'll waste too much time traveling into Center City, and 30th Street Station isn't that far from the Zoo. However, if you're not pressed for time, you can use your Amtrak ticket as a free ticket on SEPTA Regional Rail to either Suburban Station - located at 16th Street and JFK Boulevard - or Market East Station - located at 11th and Market Streets. However, the fastest way for you to get to the Zoo is to disembark at Suburban Station, and then walk one block over to 15th and JFK to board the 38, westbound. Nearly every SEPTA Regional Rail train will stop at all three stations - but make sure, before you board your SEPTA train at 30th Street - ask the conductor, "Is this train going to Suburban Station?" If so, hop on. You'll only be on for one stop, so don't bother sitting down - it's about a five minute ride to Suburban Station. b) taking the Phlash, which has a stop nearby Suburban Station. Note: you'll have to buy two tokens, for each person (so you have a round-trip) in your party, since you can't get transfers on SEPTA Regional Rail for other SEPTA lines. You can buy tokens in packs of 2, 5, or 10, along with your train tickets at your home station - and you can also buy them at the ticket window at Suburban, after you get off your train. The roots of the Philadelphia Zoo actually go back, before the American Revolution. In the early 18th century, there was interest in displaying animals, particularly among the newly discovered species in the New World. Moreover, with sailing ships venturing more and more frequently to even the previously most remote corners of the globe, mariners would bring back unusual animals they had acquired on their voyages. Also as the nation's frontiers expanded on land, interest built. When President Thomas Jefferson sponsored the Lewis and Clark Expedition, one of its objectives was studying the fauna of the newly acquired territory known as the Louisiana Purchase. 1850s - Since its founding, Philadelphia had always been a center for science, education, learning, research, and intellectual research. Many prominent civic leaders coalesced behind the idea of the creation of a Zoo. The movement was led Dr. William Camac, a well-regarded physician, and for whom Camac Street in Center City is named. March 21, 1859 - Over a year before Abraham Lincoln was elected President of the United States, the Zoological Society of Philadelphia received its charter - making it the oldest zoological society in America. However, after the Civil War broke out in 1861, and lasts till 1865, its aftermath impeded progress on opening the Zoo - there was a 15-year delay. July 1, 1874 - Just in time for the Fourth of July, the Philadelphia Zoo officially opened to the public. It has remained on that exact site, to the present day. It was quite a spectacle. Bands provided entertainment, and flags flew to celebrate the timing of the mixture of scientific knowledge with patriotism. Admission fees were somewhat cheaper then - just a quarter for adults and a dime for children - and surprisingly, they didn't rise until another half-century. The Girard Avenue Bridge also opened on the Fourth of July, providing another way to get to the new Zoo. If you'd like to leave the Philadelphia Zoo, and return to the Home Page of Enjoying Philadelphia, please click here.